After his visit to the Kingdom in May, Donald Trump decided to back the Saudi-led blockade of tiny Qatar (2015 population 2.235 million, but just 313,000 citizens) imposed less than a month later. (The) US President has long history of lucrative investment deals with Saudi Arabia but few ties to the small Gulf nation. In 1995, when Trump was struggling to make payments on one of his most important New York properties, the landmark Plaza Hotel, it was (Saudi) Prince Alwaleed bin Talal, who came to his rescue … In 1991, bin Talal also bought a huge (282-foot) yacht, the Trump Princess, from creditors at a time when Trump’s other big venture, the Atlantic City casinos, were under pressure. In fact, it was far more than mere “pressure.” In July 1991 the Trump corporation-owned Taj-Mahal casino, the world’s largest, filed for bankruptcy. So, seemingly keen to back up benefactors and apparently unknowing and uncaring of even major regional complexities, it is unlikely Donald Trump had camels on his mind. What Saudi and its allies are trying to do is increase the costs on Qatar for its actions, hoping that it will realign its policy with those of the GCC. The conflict between Qatar and its neighbours dates back to the Qatari desire for political relevance in the late 90s and early 2000s. It engaged with Israel, Hezbollah, and Iran, when its neighbors could not, and carved out a niche for itself as an arbiter and link between international powers and … groups that no one else wanted or had the capacity to deal with. Even the United States saw value in this role, asking the Qataris to liaise with the Taliban during the U.S. invasion of Afghanistan. Now the US, back-stabber in chief, has stabbed again. Civilian deaths in Iraq and Syria from coalition strikes were roughly eighty per month during the Obama White House, compared to roughly three hundred and sixty per month during Trump’s administration. With such disregard for human life, camels, if they have ever even registered as existing in his seemingly gnat-like attention span, don’t stand a chance. Another camel owner described these great, graceful “ships of the desert” as exhausted and confused, not knowing which way to go in temperatures of 50 degrees C – 122F. Farmers recounted that without the intervention of the Qatari government the plight of the animals could have been worse. 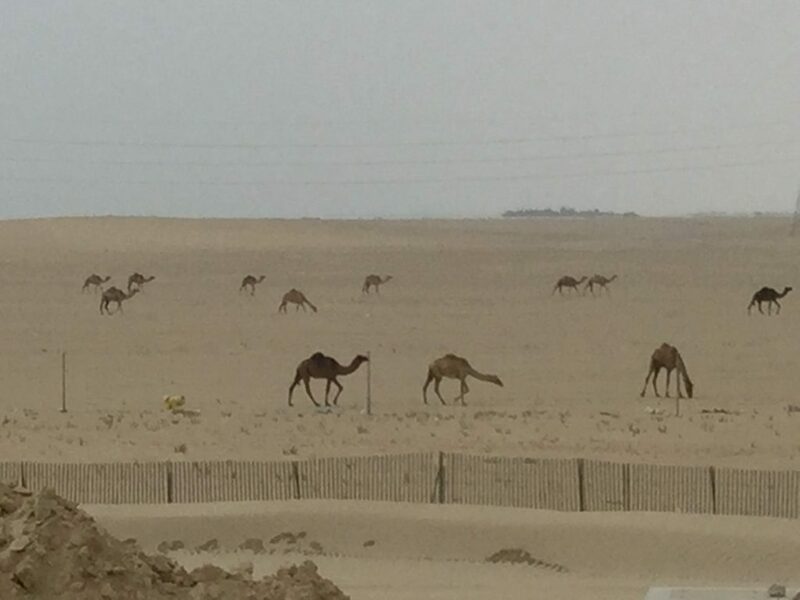 The Environment Ministry provided emergency shelter on the Qatari side of the border with water tanks and food for more than eight thousand camels. Veterinarians and animal experts were also provided. 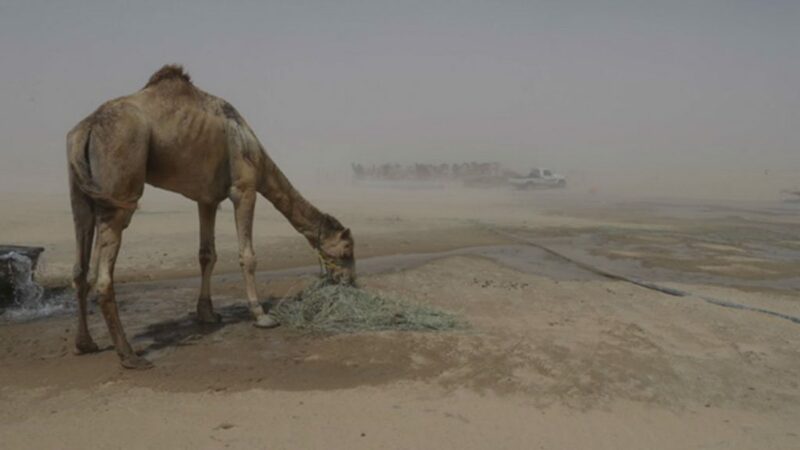 The speed of the expulsion left farmers with huge logistical problems, with camels lost, their owners not knowing whether they were dead or alive. All too often around the world, working animals and livestock become the forgotten victims of conflict and political disputes. It’s also important to remember that the communities that depend on working animals worldwide are usually the poorest in society – these animals are often all they have and are absolutely crucial to their livelihoods. 50,000 Qatari camels remain in Saudi Arabia. The outcome of their fate remains unknown. There is a poignant irony at this treatment of the camels by Saudi Arabia, custodian of the two holiest sites in Islam, Mecca and Medina. When the Prophet Muhammad left Mecca for Medina he allowed his camel to roam, deciding that where she stopped to rest would determine where he would make his home. In the Qur’an the 17th verse of the Chapter Al-Gashiyah asks: “Do they not look at the Camels, how they are made?” It is explained that as the wonder of all creatures, the camel is created with many characteristics and then placed on earth as a sign of the uniqueness of the Creator and Creation. The camel gifted with superior physical features, to survive the harshest of climates and conditions, has been given to the service of mankind. Mankind, however, has the responsibility to recognize, respect, all miracles of creation throughout the universe. It has to be wondered if the custodians of the holy cities, ruling from Riyadh, are as forgetful of the inherited holy tenets as those in Washington are unknowing and uncaring. They are stateless and the camels are now applying to UN for the relevant docs which will enable them to stroll through the Qatari desert where there is absolutely nothing to eat, since they are not allowed to go back to the KSA. So far, Washington has not demanded a wall be built. This article was posted on Saturday, July 22nd, 2017 at 1:58am and is filed under Donald Trump, Life/Animal Rights, Qatar, Saudi Arabia, United States.